Celebrating the life of ALBERT "SKIPPY" FREITAS, JR.
Be the first to share your favorite memory, photo or story of ALBERT . This memorial page is dedicated for family, friends and future generations to celebrate the life of their loved one. 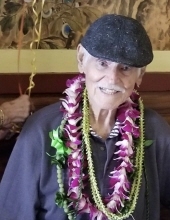 Obituary for ALBERT "SKIPPY" FREITAS, JR.
Age 85, of Kailua passed away on January 22, 2019 in Kailua. He was born in Honolulu and was a retired Local 675 plumber and a U.S. Navy veteran. He is survived by daughters Michelle Abreu (Danny), Jennifer Centeio (Bartley), Elnora K. “Chubby” Ringer; sons Eric Freitas (Lena), Tyler Freitas (Maricar), Bernard P. Kea Jr.; 13 grandchildren and 9 great-grandchildren. Brother; Edward Freitas (Donna); Sister; Doreen Carreira (James). Visitation 5:30 p.m. on Friday, February 1, 2019 at Nuuanu Memorial Park & Mortuary, services 6:30p.m. Casual attire. No flowers. Arrangements Provided By: Nuuanu Memorial Park & Mortuary LLC. To send flowers or a remembrance gift to the family of ALBERT "SKIPPY" FREITAS, JR., please visit our Tribute Store. "Email Address" would like to share the life celebration of ALBERT "SKIPPY" FREITAS, JR.. Click on the "link" to go to share a favorite memory or leave a condolence message for the family.